We are giving thanks to the Lord and recounting his wonderful deeds! 1. The letter below was written last month to her sponsor by a girl attending Nkumba Christian Primary school (in Uganda, Africa). It is written with amazing clarity & maturity for a 13-yr old girl. I humbly greet you in the name of our Lord Jesus Christ, who is working with and in you. I thank you sponsor for your good heart that you have decided to sponsor me in my studies and in everything. May the living God bless you. And I also promise that in the name of Jesus Christ, the Son of the living God, that I will use this support to study hard and to glorify God’s name, who always cares for me and you. Actually, at the death of my father, I thought that the world had ended because we had no one to help us. Mum was not working and my sisters, too. But there is God who always fulfills his promises–whereby he says in Jeremiah 49:11 “Leave the orphans with me and I will take care of them. Widows can depend on me.” So sponsor, in His scripture, that’s where we see that God is fulfilling his promises, and may God’s grace flow like a spring of water in your family. I love you so much. Yours in Christ. 2. 7 more children were sponsored this week, bringing us to a total of 15 new orphans sponsored since Seggy & Mark’s arrival in the U.S. 35 to go to meet our goal of 50! 3. 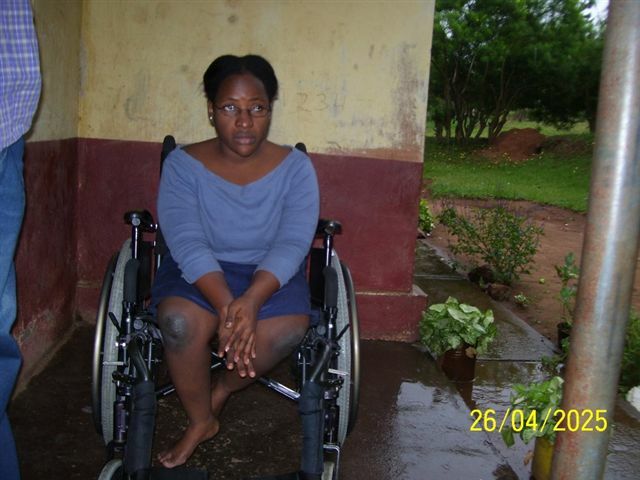 A wheelchair was provided for Juliette, a 22-yr old disabled young woman. She had been forced to crawl on the floor. one person sold some old coins and was exceedingly surprised and overjoyed to receive $2550 for them!